Lighting, Composition, and Subject are the key factors in great photography. All the technical know how and gear mean little without great light, good composition and a nice subject. This article starts a series on the little know but all important factors in photographs with impact. "Light makes photography. Embrace light. Admire it. Love it. But above all, know light. Know it for all you are worth, and you will know the key to photography." The object is nothing; light is everything. "I knew, of course, that trees and plants had roots, stems, bark, branches and foliage that reached up toward the light. But I was coming to realize that the real magician was light itself...."
There is no closed figure in nature. Every shape participates with another. No one thing is independent of another, and one thing rhymes with another, and light gives them shape. I am often asked by new photographers what it takes to learn photography. Here is what I think is most important. I'm going to advise a non-traditional approach to learning photography. The traditional view to learning is to start out manual and learn all the settings. But the problem with this approach is it is highly technical and difficult for many to grasp. People new to photography can become so frustrated at the technical details that they never get to real photography. Or they become adept at making the perfect exposure, but do not understand light and fail to make photographs with impact or emotion. The core of photography is lighting, composition and subject. Repeat: lighting, composition, and subject. And you can't fix it in photoshop. If the lighting, composition, and subject are poor, no photoshop work can fix it. Figure 1. 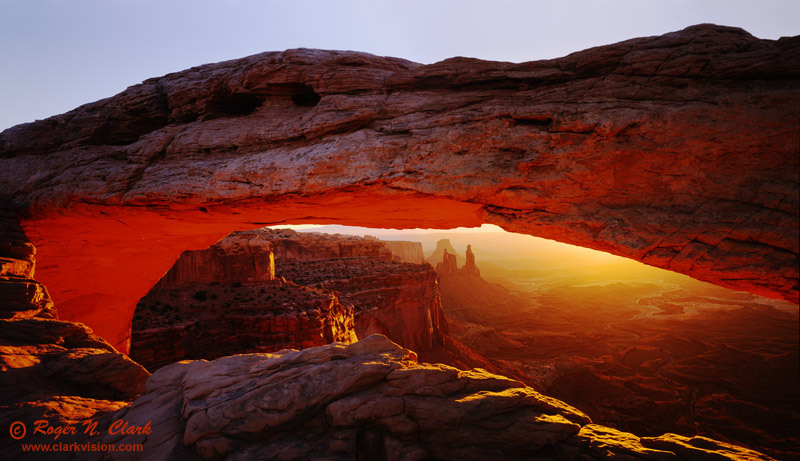 Mesa Arch Sunrise, Canyonlands National Park, Utah. 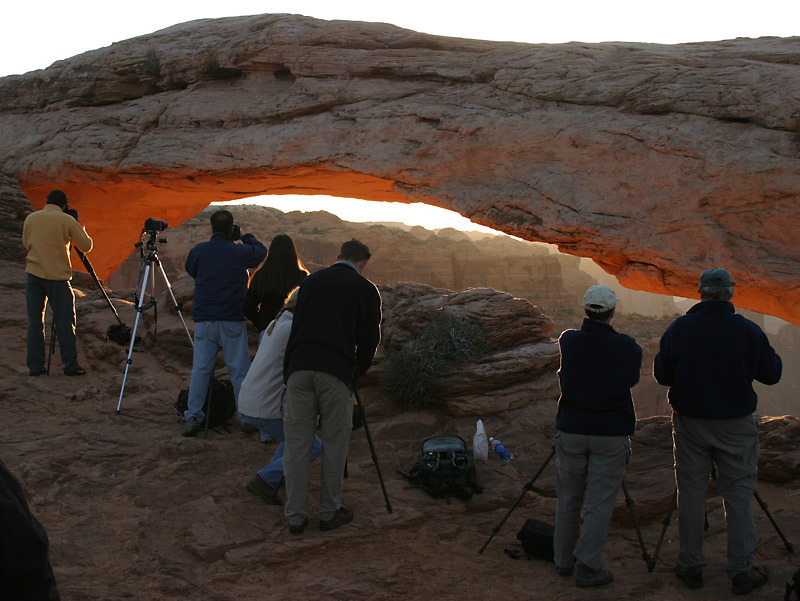 An example of directional light from the sunrise, reflected diffuse light illuminating the underside of the arch, and diffuse light illumunating the shadow areas. Now, I do not mean one should not learn the technical stuff, like exposure, ISO and depth of field, but modern cameras, even in program or other automated modes do a very good job of making good settings in many, but not all situations. For the beginning photographer, let the modern camera do that job while you learn the more important details of lighting, composition, and subject. Once you learn some about lighting, composition, and subject, you can start to include learning about exposure meters and when they might estimate poorly so you can correct it and make a better image. You can learn when to boost ISO and about depth-of-field. It matters not what the f/stop ISO and exposure time are if you don't have great lighting, good composition, and an interesting subject. When the three of these come together, the photo has impact (assuming exposure is good, but most modern cameras automatically make good exposures). So my advice is to read books and online tutorials on lighting, composition, and subject. Set your camera to program or auto everything to start out. Don't get bogged down in the technical details of f/stops, exposure, depth of field, ISO. Most modern cameras have sports, portrait, landscape and other modes. Use them first and learn lighting, composition, and subject. After you are getting pretty good with lighting, composition, and subject, then you can start to learn what those different modes mean. After learning f/stops, ISO, exposure time, depth of field and other technical details, you can push to new heights in your photography, and perhaps making those "WOW!" photographs. Some say shoot, shoot, shoot. I disagree. Others give some good advice: take notes and slow down. While getting out and making photographs is very important, there is a major difference between getting out and "shooting" versus getting out and making every image count. After reading about lighting, composition, and subject, go out at different times of day. Start with one subject and try different things to make a great image. Different angles to the sun. If you read the right books and follow and understand lighting, composition, and subject, you will have a big head start. Now, the key in this study is to NOT take a lot of pictures. Learn to see: if it is not a great image in the viewfinder, don't take the picture. Make every image you take a winner (generally even the top pros with years of experience can't make every image a keeper). But the more experience and the more you understand lighting, composition, and subject, the more keepers you will have. If you go out and the lighting, composition, or subject is not great, don't take a picture. Learning when not to take the picture is just as important as learning when to take the picture (Figure 2). Have you gone out with your camera gear and not taken a picture? This is the hardest thing for the novice to learn. Figure 2. Poor light at a Mesa Arch Sunrise, Canyonlands National Park, Utah. An example of when the light is poor even though it is sunrise when the light is often great. Compare with Figures 1 and 3. Figure 3. Amazing light at Mesa Arch, Canyonlands National Park, Utah. 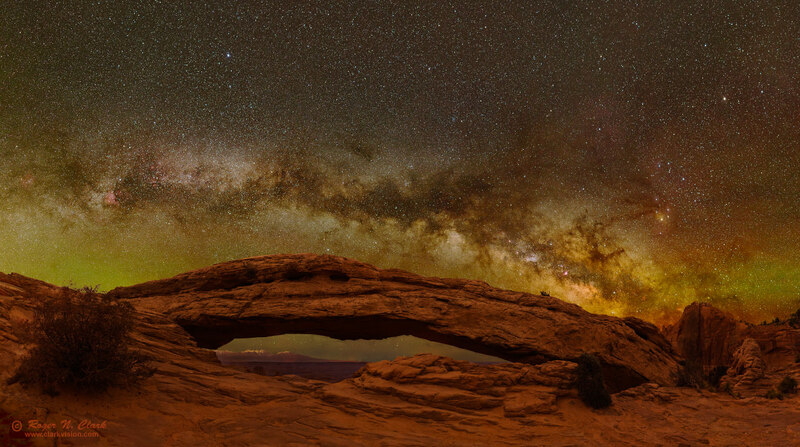 The Milky Way rises over Mesa Arch late in the night. This scene is all natural light: the light of the night sky includes stars and nebulae shining on the landscape. Other light is red and green banded airglow, most prevalent near the horizon on each side of the arch. The red+green airglow imparts a warm yellowish light on the landscape. No artificial lights were used to illuminate the arch. I have surveyed dozens of books in bookstores in addition to the few dozen photo books I have in my house. It is a rare book that really treats lighting well. There are books that discuss studio lighting, but natural light is rarely discussed for more than a few pages, and often with significant errors. For example, here is one book: Bill Fortney's Great Photography Workshop, 2003 where he states "there are two basic kinds of light: specular and diffuse." Well, there are many other kinds of light. Specular light is light that is reflected in predominantly one direction. Diffuse light is reflected over many directions. There is also absorbed light, transmitted light, emission line light, polarized light, and continuous spectral emission light, to name a few. The light incident on a scene or subject may be directional, as in direct sunlight, or diffuse, as in light from a cloudy sky. In the following series, I'll describe many concepts that are rarely known. Some master photographers seem to know these things but can not describe it, and may never have heard of the technical terms, like phase angle, but they understand the subtleties of the phase angle and intuitively use it to make great images. Hopefully with the information I present, you can use the knowledge to improve your photography faster.